In "A Response To Brian Burke’s Washington Post Article", I stated that a team would actually be better served coming up short of the first down on 1st down. They would be better off setting up a 2nd and short than 1st and 10, unless they were able to surpass the threshold of 4 yards beyond the first down marker. All of these stats are based on normal teams who typically punt on 4th down. If they planned to go for it more optimally on 4th down, I suspect they would need even more than 4 yards to justify getting a conversion. Before I go on about the exceptions, I thought it would be useful to get a bit more specific about the situations in which a 1st down conversion is not better than a 2nd and short. 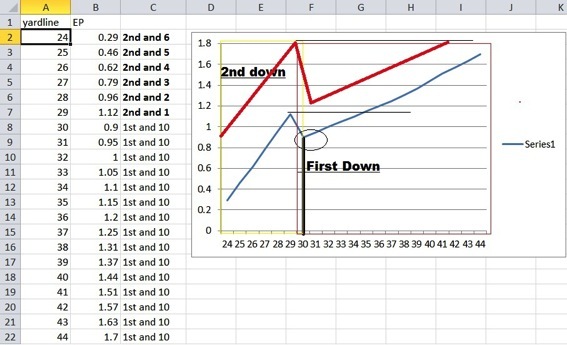 Here is a graph and table of the expected points given the situation. While any 1st and 10 is more favorable than a 2nd and 3, a 2nd and 1 would still be 5 yards better than a 1st and 10. In other words, a 2nd and 1 on your own 29 yard-line is worth more expected points than a 1st and 10 on the 34. I personally believe that if teams would go for it more optimally (more often), you would see a near parallel relationship and one that would look something like this (note line in red). I suspect intentionally going down to make a 2nd and 2 would be worth about 7 yards past the first down marker (for teams that go for it on 4th down). I suspect that a 2nd and 1 would be worth about 10 yards beyond the 1st down. 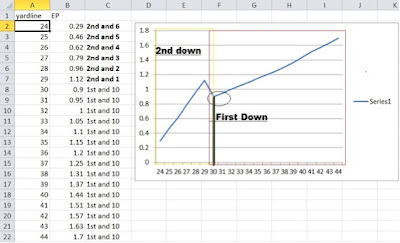 The Win Probability model doesn’t match the conclusions of the Expected Points model. I find it strange that a Win Probability could remain the same while the expected points is greater, but maybe the model is based on field position and time left more than anything. Another interesting situation I want to look at is around the goal line. Initially I thought that perhaps first and 10 at the 15 yardline was better than a 1st and 10 at the 10. The rational was that they could convert and be left with 4 additional downs, and the defense is less congested allowing wider zones to throw to. While this may be true, in terms of however this EP model was constructed, it is not. However, the slope of the line flattens out. 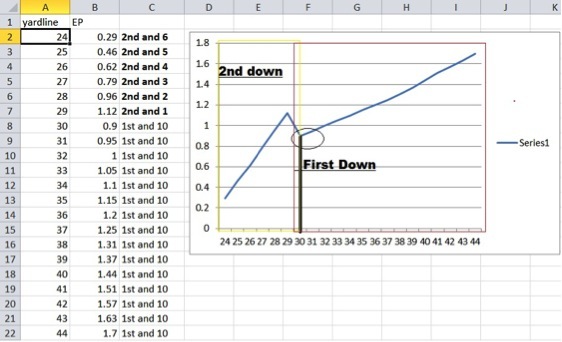 While every yard still increases your value, the rate of its increase decays as you approach the goal line. When QBs should simply “give up” on converting on 2nd down is what I touched upon briefly and wanted to get into more in depth. I will have to delay that one more post as it will contain a lot of important concepts I want to get into. For now just consider that AFTER the ball is snapped and play develops, all bets are off. As Mike Tyson said “Everyone has a plan, until they get hit”. 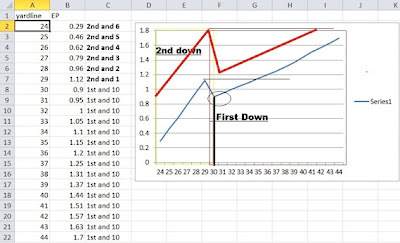 As a play develops, the odds of conversion change. As information changes, the odds change as well. Statistically these situations are referred to as “variable change” and will be the subject of a future post. Sorry guys I need to edit this I will get an updated copy in soon. Edited copy is in and this post is updated. Thanks Ed. Should JJ Watt win the MVP award?